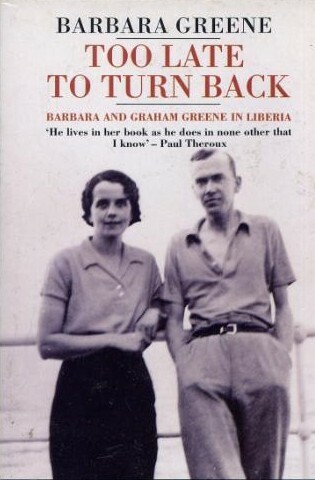 Too Late to Turn Back (also published as Land Benighted) is Barbara Greene’s account of her trek with her cousin, Graham Greene, through the Liberian bush in 1935. From that adventure, Graham Greene produced Journey Without Maps. Barbara’s account, to borrow from Paul Theroux, is however “quite a different pair of shoes”. The difference between Graham and Barbara’s accounts can be characterised by the books they took with them to Liberia. While Graham took Burton’s Anatomy of Melancholy and produced the darker more introspective Journey Without Maps, Barbara travelled with Saki and Somerset Maugham and produced a more accessible, vivacious travelogue. While Too Late to Turn Back is considered valuable as a companion piece to Journey Without Maps and as a portrait of Graham Greene, there is, along side the self-effacement and modesty of its author, much more to Too Late to Turn Back. Barbara Greene was 23 years old when, having been “merrily drinking champagne”, she met her cousin Graham at the wedding reception of Hugh Greene (Graham’s brother) (Although this article suggests that Barbara may have disguised her real age). Greene’s plans for his Liberian adventure were already well advanced and, because everyone else had refused, Greene asked his cousin Barbara if she would accompany him. Barbara promptly agreed although she “had no clear idea of where he was going to”. Both Graham and Barbara were later to recall the rashness of their decision to travel to Liberia. Barbara described them both as being “two innocents” whose “ignorance was abysmal”. Regretting her “champagne decision”, Barbara hoped her father would forbid her from making the journey but, to her surprise, found that he approved and so, within a fortnight, they were on their way. As Barbara later acknowledged, it was “unusual then for young girls to adventure off into the wilds”, but “adventure off” she did and what follows in Too Late to Turn Back is the account of a young woman from a privileged existence who had admitted to enjoying her creature comforts roughing it through the African bush. As a travelling companion, Graham Greene was complimentary about Barbara, describing her in Ways of Escape as being “as good a companion as the circumstances allowed”. He also recalled that she left all the decisions to him and never criticised when he made the wrong one. An arduous journey is likely to strain even the closest of relationships of friendships and theirs was no exception. Graham noted that, towards the end of the trip they would “lapse into long silences” but found this “infinitely preferable” to raised voices. Barbara recalled many years later that they “never quarrelled, not once” and also that, although she had not, at any time, been the least bit helpful she “never, never complained”. This last detail is a telling one. Despite the seemingly carefree manner of her departure and references to the Savoy Grill and her privileged life in London, Barbara must have had considerable pluck to undertake a journey on foot through the West African bush as a lone woman with a cousin she regarded only as an “acquaintance” and an entourage of 29 carriers, cooks and guides. They faced many hardships during their trek and Graham’s health progressively worsened prompting Barbara to fear he may die. Barbara later confessed to being unsure of how much the journey changed her although admitted it must have done unconsciously. She thought that managing “to stick through all difficulties to the end” showed “no particular merit” on her part as they had reached the point of no return early in their trip. Although probably turn to a certain extent, one senses that this is more modesty and self effacement. In Ways of Escape, Graham later stated that Barbara writing her book was the one thing in which she had disappointed him. He had been so busy with his own notes that he had not even noticed that Barbara was making her own. Greene was, however, grateful that Barbara had at least waited until a few years after his own had been published. In fact, Barbara never meant for her book to be published and had only re-written her notes so that she had something to read to her father when he became ill. Originally published as Land Benighted in 1938, Barbara’s account was reprinted in 1981 with a new forward by her and with an introduction by Paul Theroux. Unfortunately, the book is currently out of print but second hand copies can be found online.